As a voracious reader of all-things related to the Entertainment Industry, there are certain authorities I trust more than others. For example, I don't believe anything unless it appears in People magazine (don't judge me). One of my all-time favorite gossip columns was written by none other than Ted Casablanca for E. He was the BEST and I miss his salacious Blind Vices column to this day (also, who is Toothy Tile?!?!). Sadly (for me, not for him), he went off to run an art gallery in Palm Springs, which he appears to love. More power to him! 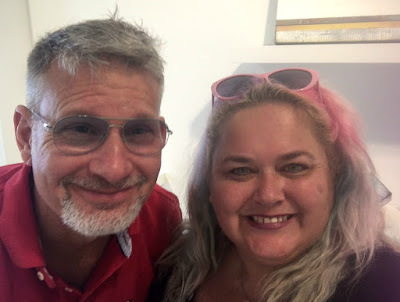 As I've loved him for years and always wanted to meet him, I couldn't pass up the opportunity to pop by his gallery when we were in Palm Springs. What a great guy! He couldn't have been nicer, especially to a super fan like me. He also shared that he's writing a book. Squee! Can't wait to read it! OMG!!!! I have wondered who "Toothy Tile" was for ages!! LOL!